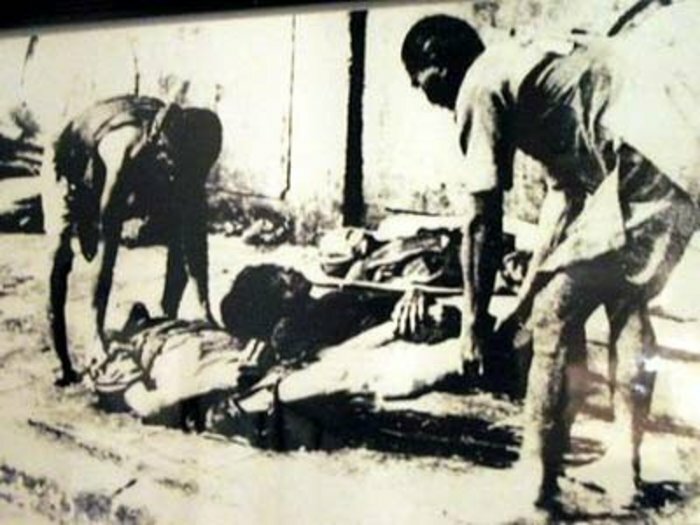 The Vietnamese Famine of 1945 (Vietnamese : Nạn đói Ất Dậu - Famine of the Yiyou Year) was a famine that occurred in northern Vietnam in French Indochina during World War II from October 1944 to late 1945, which at the time was under Japanese occupation from 1940 with Vichy France as a puppet government. Between 400,000 and 2 million people are estimated to have starved to death during this time. The demographics vary from French estimates of 600,000-700,000 dead, to official Vietnamese numbers of 1,000,000 to 2,000,000 victims. Indirectly, the mismanagement of the French administration in Vietnam played a role. The French reformed the economy in order to serve the administration and to meet the needs of war, because they were being invaded themselves. Natural causes included natural disasters such as droughts and floods destroying northern crops. The crop failures of 1943-45 were compounded by lack of dike maintenance following US bombing of the north and the catastrophic rainfall of August-September 1944, causing flooding and loss of rice plants. After the Great Depression in the 1930s, France returned to its policy of economic protectorate and monopolized the exploitation of natural resources of French Indochina. The people in French Indochina had to increase the economic value of the area by growing cash crops in place of lower-value agricultural produce, but only the French and a small minority of Vietnamese and Hoa and some people in the cities benefited. The exploitation of natural resources is the use of natural resources for economic growth, sometimes with a negative connotation of accompanying environmental degradation. It started to emerge on an industrial scale in the 19th century as the extraction and processing of raw materials developed much further than it had in preindustrial areas. During the 20th century, energy consumption rapidly increased. Today, about 80% of the world’s energy consumption is sustained by the extraction of fossil fuels, which consists of oil, coal and gas. Another non-renewable resource that is exploited by humans is subsoil minerals such as precious metals that are mainly used in the production of industrial commodities. Intensive agriculture is an example of a mode of production that hinders many aspects of the natural environment, for example the degradation of forests in a terrestrial ecosystem and water pollution in an aquatic ecosystem. As the world population rises and economic growth occurs, the depletion of natural resources influenced by the unsustainable extraction of raw materials becomes an increasing concern. When the war started, France was weakened. In East Asia, Japan began to expand and viewed French Indochina as a bridge into Southeast Asia and a means to isolate and further weaken the Nationalist government of China. In mid-1940, metropolitan France was occupied by Germany and Japan increased pressure on France and entered French Indochina that September. Vietnam was pulled into a wartime economy, with France and Japan competing in administration. 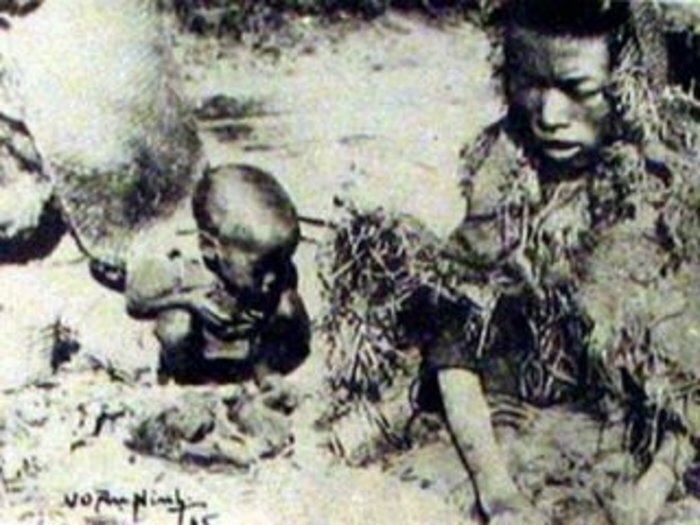 Japanese troops forced farmers to grow jute instead of rice, thus depriving them of needed food, but in reality France had started the same policy earlier to a smaller degree. The land set aside for growing staple crops such as maize and potatoes was decreased to make land for growing cotton, jute, and other industrial plants. Because of the decreased land available for growing, harvests of staple crops decreased considerably. Crops were also exported to Japan. The militaries of both France and Japan forcibly seized food from farmers to feed their troops. [ clarification needed ] By 1941 there were 140,000  Japanese troops in French Indochina. During the occupation of French Indochina by Japan, the Allies made frequent air strikes against roads, warehouse and transportation facilities. This made the transport of rice from the south to the north extremely difficult. In the meantime, the puppet Vichy French civilian administration was dysfunctional, unable to distribute remaining food stocks to areas where needed. 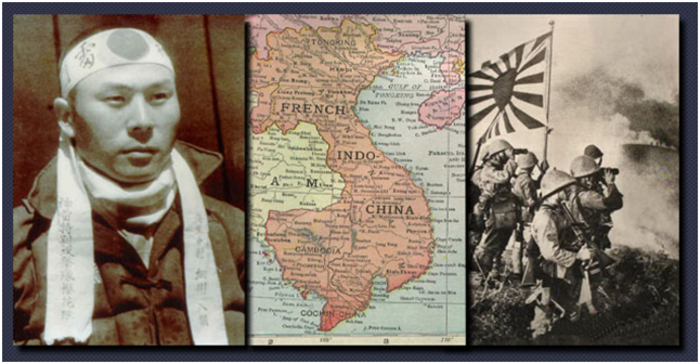 In March 1945, the Japanese-sponsored Empire of Vietnam headed by Trần Trọng Kim supplanted the French administration. While this new government made efforts to alleviate the famine,[ dubious – discuss ] the inadequate food supply, coupled with hoarding of food by the Imperial Japanese Army, made their efforts futile. In northern Vietnam, a drought coupled with pests caused the winter-spring harvest of 1944 to decrease by 20%. After that there was a flood during the harvest season, causing the crisis to occur. This hence led to the famine in 1945. 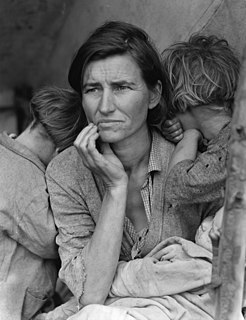 The exact number of deaths due to the 1944-1945 famine is unknown and is a matter of controversy. Various sources estimate between 400,000 and 2 million people starved in northern Vietnam during this time. In May 1945, the envoy at Hanoi asked the northern provinces to report their casualties. Twenty provinces reported that a total of 380,000 people starved to death, and 20,000 more died because of disease. In October, a report from a French military official estimated half a million deaths. The French Governor General Jean Decoux wrote in his memoirs A la barre de l'Indochine that about 1 million northerners starved to death. Modern Vietnamese historians estimate between 1 and 2 million deaths. Ho Chi Minh in his Proclamation of Independence of the Democratic Republic of Vietnam on September 2, 1945, used a 2 million figure. The famine played a part in the coming war between the French and Viet Minh. In March 1945 the Viet Minh (a Communist-controlled common front fighting for the independence of Vietnam) urged the population to ransack rice warehouses and refuse to pay their taxes. Between 75 and 100 warehouses were consequently raided. This rebellion against the effects of the famine and the authorities that were seen as responsible for it bolstered the Viet Minh's popularity and they recruited many members during this period. 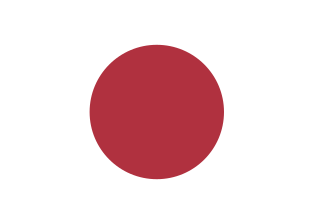 The Japanese coup d'état in French Indochina, known as Meigo Sakusen, was a Japanese operation that took place on 9 March 1945 towards the end of World War II. With Japanese forces losing the war and the threat of an Allied invasion of Indochina imminent, the Japanese were concerned about an uprising against them by French colonial forces. Trần Trọng Kim, courtesy name Lệ Thần, was a Vietnamese scholar and politician who served as the Prime Minister of the short-lived Empire of Vietnam, a state established with the support of Imperial Japan in 1945. This came after Japan had seized direct control of Vietnam from the Vichy French colonial forces during the Second World War. He was an uncle of Bui Diem. 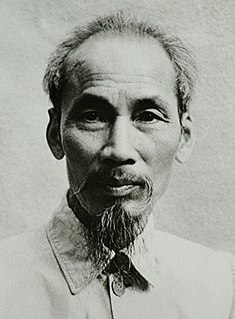 The Proclamation of Independence of the Democratic Republic of Vietnam was written by Hồ Chí Minh, and announced in public at the Ba Đình flower garden on September 2, 1945. It led to the independence of Vietnam. Rice production in Vietnam in the Mekong and Red River deltas is important to the food supply in the country and national economy. 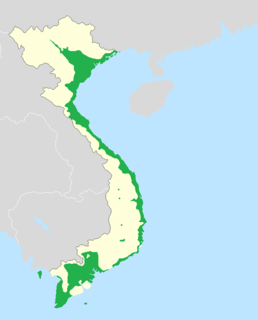 Vietnam is one of the world's richest agricultural regions and is the second-largest exporter worldwide and the world's seventh-largest consumer of rice. The Mekong Delta is the heart of the rice-producing region of the country where water, boats, houses and markets coexist to produce a generous harvest of rice. Vietnam's land area of 33 million ha has three ecosystems that dictate rice culture. These are the southern delta, the northern delta and the highlands of the north. 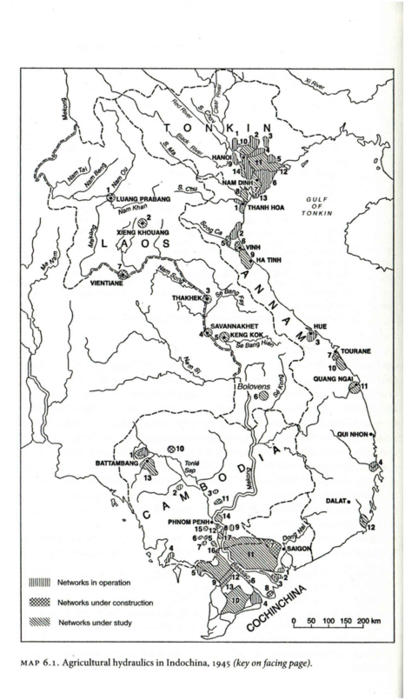 The most prominent irrigated rice system is the Mekong Delta. Rice is a staple of the national diet and is seen as a "gift from God". The War in Vietnam, codenamed Operation Masterdom by the British, and also known as Nam Bộ kháng chiến by the Vietnamese, was a post–World War II armed conflict involving a largely British-Indian and French task force and Japanese troops from the Southern Expeditionary Army Group, versus the Vietnamese communist movement, the Viet Minh, for control of the country, after the unconditional Japanese surrender. 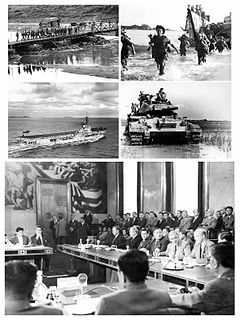 1940—1946 in the Vietnam War focuses on events influencing the eventual decision for military intervention by the United States in the Vietnam War. 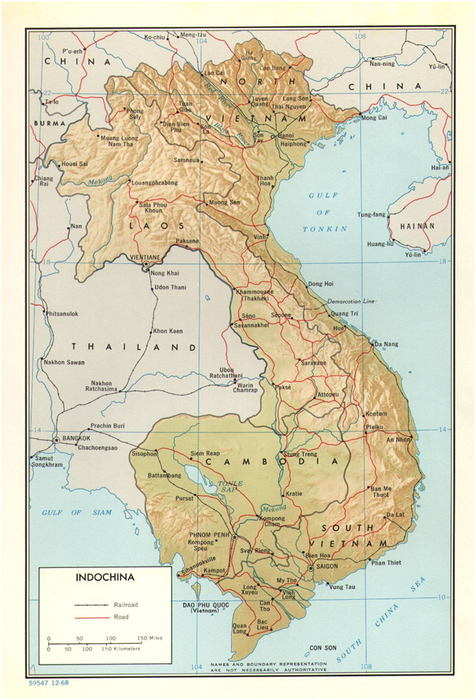 French Indochina in the 1940s was divided into five protectorates: Cambodia, Laos, Tonkin, Annam, and Cochinchina. The latter three made up Vietnam. In 1940, the French controlled 23 million Vietnamese with 12,000 French soldiers, about 40,000 Vietnamese soldiers, and the Sûreté, a powerful police force. At that time, the U.S. had little interest in Vietnam or French Indochina as a whole. Fewer than 100 Americans, mostly missionaries, lived in Vietnam and U.S. government representation consisted of one consul resident in Saigon. ↑ Charles Hirschman et al. "Vietnamese Casualties During the American War: A New Estimate" Archived June 20, 2010, at the Wayback Machine . Population and Development Review (December 1995). ↑ HUFF, GREGG (2018). "Causes and consequences of the Great Vietnam Famine, 1944–5". The Economic History Review. doi:10.1111/ehr.12741. ISSN 1468-0289. ↑ Reid, Anthony (2015). A history of Southeast Asia : critical crossroads. John Wiley & Sons. p. 323. ISBN 978-1118513002 . Retrieved 24 September 2018. Wikimedia Commons has media related to 1945 in Vietnam .